This year, World Suicide Prevention Day falls on Sunday, September 10. According to the WSPD website, more than 800,000 people die by suicide, and up to 25 times as many make a suicide attempt, each year. According to statistics provided by the Canadian Association For Suicide Prevention, 11 Canadians will end their lives today. And another 11 will do so every day after that. Globally, almost one million people will die by suicide. Let’s put that figure in perspective: Each year suicide ends more lives than those claimed by war, acts of terrorism, and homicide — combined. Further, each person who dies by suicide leaves behind at least 7 to 10 bereaved by suicide, so that means that each day in Canada, there is an additional 77 to 100 people who will be forced to make sense of a seemingly senseless loss of a family member. Here at the Lucas Fiorella Friendship Bench, through our #YellowIsForHello campaign, we’ve chosen to focus on preventing student suicides by increasing peer-to-peer mental health conversations. We join our fellow volunteers around the country, and the world, in an international effort to create zero-suicide communities. But that takes all of us. It takes all of you. 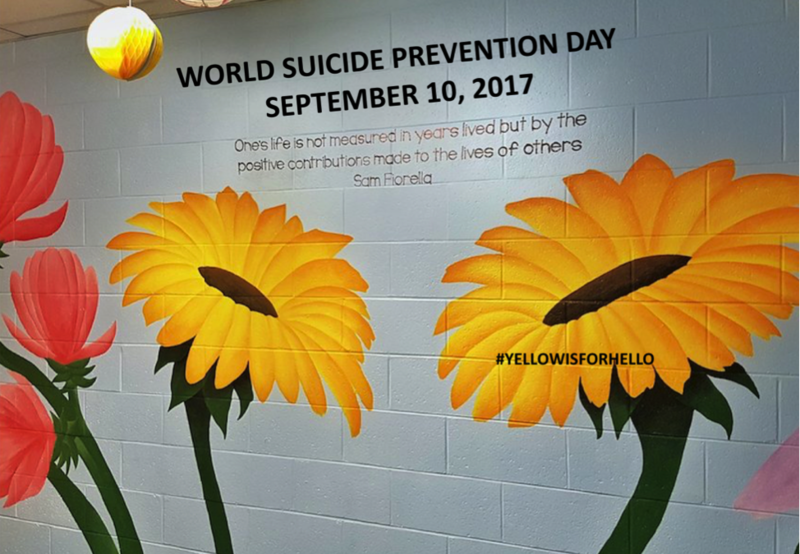 This year, to commemorate World Suicide Prevention Day, we are unveiling a Friendship Bench and #YellowIsForHello mental health campaign at King’s University College, in London Ontario during the day and participating in a community forum on suicide prevention in Oakville Ontario in the evening. Join us at 11 AM for the unveiling of the latest Friendship Bench, featuring activities and presentations by Sam Fiorella and university dignitaries. Join us from 7 PM to 9 PM for a keynote presentation by Dr. Ian Dawe, Program Chief & Medical Director, Mental Health at Trillium Health Partners. Following Dr. Dawe’s presentation will be a panel discussion including various mental health advocates, including Friendship Bench co-founder Sam Fiorella. If you’re not in the area or not able to join us for these events, please take a moment on that day to reach out and say “hello” to family and friends. Openly and honestly discuss mental health and suicide prevention. It only takes one HELLO to start a conversation, and that hello could save a life.